It is not possible to write it in PIC with single PICkit2. It is not possible to write it in PIC of 18 pins and 28/40 pins though it is possible to write in the PICkit2 starter kit in PIC of 8/14/20 pins even in the substrate of the attachment. Then, the ZIF adaptor substrate for general-purpose PICkit2 was made by oneself. The PIC microcomputer (Peripheral Interface Controller) is IC in which the program can be written with IC developed to control peripherals. It has the operation processing function and the memory just like CPU, and PIC is controlled with software (program). However, the capacity of the processing performance and the memory is not large like CPU. I was using the one that AKI-PIC programmer Ver4 and the PICkit2 starter kit have been remodeled to writing PIC up to now. 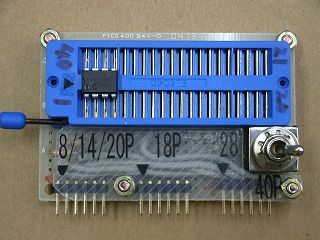 Because the one that the PICkit2 starter kit was remodeled had corresponded only to a part of 8 pins, 14 pins, and 20 pins, the ZIF adaptor substrate for general-purpose PICkit2 was made by oneself. 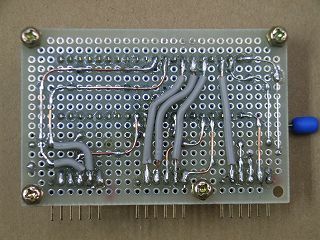 This picture has been completed for PICkit2 ZIF adapter board. 48mmX72mm substrate, 40P of the ZIF socket, pin header type L (1x 6P x3), and the toggle switch with 2-circuits 2-contacts are attached. Very compact and made too much, I've lost my place to write letters. Plastic plate screwed to reluctantly put the letter in the label writer. Usage, PICkit2 fit into the PIC pin connector according to the number. Directions to install a PIC, PIC align it with the Pin 1 Pin 1 regardless of the type. 40P and 28P of the PIC to switch if the switch wiring. General to say, PIC10F and PIC16F57 series such as this adapter so you can not write a different pinout. This is a photograph on the pattern side of the ZIF adaptor substrate for completed PICkit2. Very easily refreshingly as the circuit. The knack of making it well is to connect the connector mutually in parallel on the component side by the vicinity of 6P connector that often sees the schematic diagram and connects it with PICkit2. Moreover, it wires by using 0-ohm resistance well on the component side. I used three 0-ohm resistance. The wiring for 40P to ZIF (Zero Insertion Force socket pressure socket) can be minimized by doing so. The toggle switch of two points of contact on the road is processed for the panel installation and installed in the substrate by force twice. It is very narrow. 3mm machine screw and the nut are used instead of the rubber foot. I will make it to dust division and short prevention by obtaining the cover of plastic under this pattern side later. It became good feeling. This is a schematic diagram of the ZIF adaptor for PICkit2. When being become a problem later if the schematic diagram is not still left, it confirms and it is not possible to adjust. The connector in the vicinity of 6P connector connected with PICkit2 mutually was first connected in parallel mutually. Because the wiring for 28P and 40P was a little different, it switched with the switch. Neatly and wanted the toggle switch was put up though there was information of unquestionable, too, even if it did not switch. It might not wire 8, 11, and 12 pins when PIC is 28P and 40P. This is not necessary for this switch switch if omissible.